Our project was featured in the fall 2016 edition of Breakthroughs magazine. On the 16th of June 2016, the second Crete IDEA workshop took place in Greece. "ETH Zurich unraveled the mysteries of science and technology in a series of public gatherings held in San Francisco". For more information about the IDEA event at ETH Meets California, see the event program, a video of the lecture, and photos. A publication in GigaScience: "Simulating social-ecological systems: the Island Digital Ecosystem Avatars (IDEA) consortium". A publication in Nature: "Tropical paradise inspires virtual ecology lab". to be held at Pembroke College in Oxford on January 11-13.
to be held at Gump Station on February 1-5.
to be held at ETH Zurich on March 9-11. News of the Moorea IDEA reaches Greece. News of the Moorea IDEA reaches Italy. Tropical paradise inspires virtual ecology lab. Human activities are driving climate change and biodiversity loss on a planetary scale. Resulting impacts on the Earth System are so great they define a new geological epoch: the anthropocene. With the human population expanding beyond 7 billion in the 21st century, global environmental sustainability is the defining challenge of our time. The transition to sustainable development, however, requires a far better understanding of complex socio-ecological systems at local and national scales of management action. To that end, a key research goal is to build functioning digital simulations, ‘avatars’, of model islands, cities, and eventually countries. Such advances will pave the way for a Predictive, Preventive, Personalized, Participatory, and ultimately a Planetary (P5) approach to policy making for sustainability. The outcome: communities and countries managing their ecosystem wellness and avoiding the social consequences of ecological collapse. The Island Digital Ecosystem Avatars (IDEA) Project is inspired by efforts to digitize an entire island ecosystem from 'genes to satellites' and was initiated by researchers at UC Berkeley, CNRS-EPHE, ETH Zürich, Oxford University, UC Santa Barbara and the MCR LTER. It will draw on the significant progress being made to model complex systems at other scales of biological organization - from single cells to multicellular organisms, including humans. The IDEA Project will harness and extend these efforts to build advanced computational models of a range of complex socio-ecological systems, particularly islands (coupled natural-human systems) and cities (built environment). Understanding how biological systems function is a massive challenge requiring detailed integrative study within the system, while taking into account external processes that influence the internal dynamics. To achieve global environmental sustainability, we must apply the computational lens to the units of biosocial organization that are subject to policymaking. Although modeling entire socio-ecological systems is still in its infancy, doing so will prove scientifically productive in the short-term and is societally essential in the long-term. Identifying clearly defined units of socio-ecological organization for study is essential to our task. They should be big enough to contain human societies, but small enough for meaningful collaboration across diverse scientific disciplines. They must be accessible, both logistically and including the active support (engagement) of the local community. Island systems are particularly attractive for sustainability science because they are clearly bounded (relatively closed) and ongoing studies at larger scales (e.g., global climate models) can help incorporate external influences simply and effectively. Like organisms, each socio-ecosystem is unique, and indeed, such variation is a core challenge across the life sciences. Molecular biology, however, has demonstrated the power of focusing on a small number of model systems (e.g., the nematode C. elegans) that can be studied in sufficient depth, but also compared with other systems (e.g., the fruit fly D. melanogaster) to draw general rules. The IDEA project will apply a similar approach to a range of model socio-ecosystems. For initial proof of concept, we are assembling an international group of researchers, coordinated through the new Moorea Ecostation Center for Advanced Studies, to build a virtual representation of Moorea - the Moorea Island Digital Ecosystem Avatar. The Moorea IDEA will incorporate observations, experiments, data, and theory across a coupled 3-D marine-terrestrial landscape to model how physical, chemical, biological, and social processes interact to shape the island’s phenotype. We take advantage of the Moorea Biocode Project that has already characterized every species (>1mm) on the island from its coral reefs to mountain forests, including genetic sequences and digital photographs. 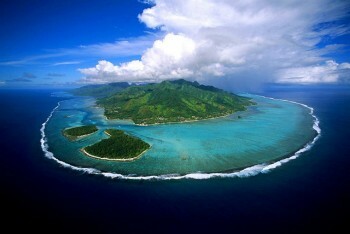 Why Moorea? A volcanic oceanic island about the size of San Francisco, 15 5m northwest of Tahiti, Moorea has significant scientific capacity through its two international research stations (CNRS-EPHE CRIOBE since 1971 and UC Berkeley Gump Station since 1985). In terms of its biodiversity, Moorea is probably the best-known tropical ecosystem in the world, hosting France’s Center of Excellence for Coral Reef Research (LABEX “CORAIL”) and the U.S. National Science Foundation’s only coral reef long-term ecological research (LTER) site. Moorea is a natural laboratory spanning marine and terrestrial environments (to 1,207m) that is constrained enough to be tractable, but sufficiently large (132 sq. Km) to contain all the elements of a complex socio-ecosystem, including a sizable human population (~ 17,000). Why Coral Reefs? A “massive jigsaw puzzle for scientists”, coral reefs are the rainforests of the sea and millions of people depend on them for food security and other ecosystem services, such as storm protection and sources of medicines. Indeed, it is said that: “no other habitat on Earth is of such importance to humans”. Tropical island reefs, however, are under threat and represent ‘canaries in the mine’ due to their sensitivity to global change. Understanding interactions between island social systems and environments, and of differential cultural responses to ecosystem change, informs policies for sustainability and resilience. Such research is truly interdisciplinary and contributes to conceptual integration across the natural and social sciences. Islands lend themselves to a systems approach, and network theory provides a conceptual framework for the Moorea IDEA. New high-throughput technologies (e.g., metagenomic sequencing and autonomous imaging systems) leverage the Biocode ‘parts list’ and enable visualization of the island’s natural-human “interactome”, a term we extend up to the ecosystem from its original use in the cell. The Moorea IDEA will support process-oriented research along with open data-sharing platforms to provide a wealth of science driven data. Combined with new analytical techniques and theory, this will develop a virtuous cycle whereby data driven discovery informs the design of mechanistic research, including experiments and further long-term observations. The key is not just big data, but linked, complete data, where a significant proportion of the system is ‘datafied’ for visualization and analysis. In this way, we will be able to assess how alternate policy scenarios might influence biodiversity and ecosystem services. The Insular Research Center and Environment Observatory is a field station for French as well as international researchers. Located in Moorea, French Polynesia, the CRIOBE is connected with the Practical School of High Studies (EPHE) and is part of the CNRS French marine stations national network. The CRIOBE's scientific activities are focused on applied and fundamental research, education and training (Thesis and master's degree student's internships) and information (press articles, awareness rising, science fair). The center is directed by Serge Planes, Research Director at the CNRS and studies Director at the EPHE. Several permanent employees are in charge of the maintenance of the buildings and equipements and are welcoming the researchers and technicians coming for specific projects. Data are collected with funding support of the Service d'Observation "CORAIL" and under the CRIOBE infrastructure and facilities. The University of California's Richard B. Gump South Pacific Research Station (Gump Station) was established in 1985 on land donated by Mr. Gump to UC Berkeley. With ~33 acres located on the waterfront at the entrance to Cook's Bay, the Gump Station provides exceptionally easy access to tropical marine systems (lagoon, outer-reef, and offshore), as well as inland to a diversity of terrestrial/freshwater habitats and archeological sites. It can host up to 50 researchers and students in onsite housing and provides field transport (boats, vehicles) as well as a range of laboratory facilities including flow-through seawater systems. The Gump Station has housed the NSF Moorea Coral Reef Long Term Ecological Research (MCR-LTER) site since 2004. The Tetiaroa Society Ecostation is located on Motu Onetahi, one of the 12 islets of Tetiaroa. Designed and built to LEED Platinum standards, the Tetiaroa Ecostation comprises of a housing facility, small dry lab and a marine lab. The Ecostation was gifted to Tetiaroa Society from Pacific Beachcomber to fulfill the shared vision of sustainable interdependence. The location of Tetiaroa allows immediate access to reef environments, archeological sites, brackish lakes and direct access to deep ocean water (pumped from 900m as part of The Brando hotel's air-conditioning system). Visitors have access to boats, kayaks, diving equipment (pre-booking required), seawater tables, aquarium and dry laboratory space, along with housing and meals. please contact Ms. Denise Pin. The series of workshops are designed to launch the IDEA Consortium, establishing its scope and organisation. The goal is to develop a detailed roadmap by the end of 2014 for building the first 'avatar' (computational model/digital simulation) of a complete Social-Ecological System: the Moorea IDEA. The meetings have formalized into a series of IDEA Consortium Meetings that involve all collaborating investigators and more focused IDEA Workshops that address specific tasks. at ETH Zurich (Switzerland), 9-11 March 2015.
the South Pacific Convergence Zone (SPCZ) which is a persistent cloud band diagonally oriented from Papua New Guinea to French Polynesia. the cold fronts associated to the tropics-midlatitude interactions. Besides, these features are affected every 2 to 7 years by the El Niño Southern Oscillaton phenomenon (ENSO), and on longer time scales (10-20 years) by the Interdecadal Pacific Oscillation (IPO). The challenging questions concerning the effect of global warming on these large scale key features and consequently, on Moorea's weather can only be addressed by using global climate models. The global model CNRM-CM5.1 developped jointly by CNRM-GAME (Centre National de Recherches Météorologiques – Groupe d'études de l'Atmosphère Météorologique) and CERFACS (Centre Européen de Recherche et de Formation Avancée en Calculs Scientifiques), which contributed to phase 5 ofthe Coupled Model Intercomparison Project (CMIP5) could be used in the Moorea IDEA project. Current global climate models typically have a computational horizontal resolution of around 100 km. They are able to spatially resolve the large-scale atmospheric circulation but fail to simulate local processes at the scale of an island. using a regional climate model (with at least 12 km resolution) and perform statistical bias correction to transpose coarse grid cell data onto local station data. This option is particularly appropriate to conduct climate change impact studies. build a database at ~100 m resolution on Moorea by performing dynamical downscaling using local operational weather forecasting or meso-scale models. Involving great computational resources, this option should be restrained to specific case studies. 1. Australian Bureau of Meteorology and CSIRO, 2011. Climate Change in the Pacific: Scientific Assessment and New Research. Volume 1: Regional Overview. 2. Vincent, D. G. (1994). The South Pacific convergence zone (SPCZ): A review. Monthly Weather Review, 122(9), 1949-1970. 3. Trenberth, K. E. (1997). The definition of el nino. Bulletin of the American Meteorological Society, 78(12), 2771-2777. 4. Salinger, M. J., Renwick, J. A., & Mullan, A. B. (2001). Interdecadal Pacific oscillation and south Pacific climate. International Journal of Climatology, 21(14), 1705-1721. 5. Voldoire, A., Sanchez-Gomez, E., y Mélia, D. S., Decharme, B., Cassou, C., Sénési, S., ... & Chauvin, F. (2013). The CNRM-CM5. 1 global climate model: description and basic evaluation. Climate Dynamics, 40(9-10), 2091-2121. 6. Taylor, K. E., Stouffer, R. J., & Meehl, G. A. (2012). An Overview of CMIP5 and the Experiment Design. Bulletin of the American Meteorological Society, 93(4). 7. Teutschbein, C., & Seibert, J. (2010). Regional climate models for hydrological impact studies at the catchment scale: a review of recent modeling strategies. Geography Compass, 4(7), 834-860. We propose to develop a comprehensive framework for modeling transport of water and water-borne materials from the island watersheds into the ambient lagoon. This task involves both the dynamic linkage of the existing numerical codes and the development of new ones. We will use the USGS model PRMS (Leavesley et al. 1983) to model the following hydrologic processes (see Figure 1): interception of rain by plant canopy, evapotranspiration, runoff, infiltration and interflow. PRMS subdivides an island’s watershed(s) into a number of homogeneous hydraulic response units (HRU) according to a set of hydrologic and physical characteristics, such as land cover, drainage boundaries, slope, etc. We will use a Geographic Information System (GIS) analysis (Viger & Leavesley 2007) to delineate the boundaries between adjacent HRUs on Moorea. A key feature of PRMS is its ability to simulate surface flow induced by both base conditions (the so-called daily mode) and extreme precipitation events (the so-called storm mode). This is essential, given the location of Moorea, close to the ITCZ and subject to dramatic variation in rainfall. Advances in computing power, mathematical modeling and quantification of uncertainty in the hydrological cycle, coupled with improved understanding of the physical and biochemical stresses acting on coral reefs, will enable us to describe the entire hydrologic system. Multi-resolution data about topography, geology, patterns of vegetation and changes in land-use patterns and precipitation serve as inputs for a physically-based model that calculates flow and transport from island surface through substrate to lagoon and surrounding reef. The model will consist of coupled modules describing surface and near-surface flow, groundwater flow, transport of dissolved contaminants, and sediment transport. Both multi-physics coupling and model parameterization will bridge between several spatial and temporal scales. The model development will be accompanied by rigorous sensitivity analysis and uncertainty quantification. This will allow us to examine connections not only to water quality per se but to the long-term health and ecology of the surrounding coral reefs. Coastal social-ecological systems worldwide are increasingly shaped by humans and natural stressors as they are facing unprecedented changes from the local to global levels. The Project INTHENSE aims to understand the effect of those stressors to help management and decision-making. From the case study of Moorea Island, French Polynesia, we developed a participatory approach using Bayesian Network modelling in order to understand the main consequences of natural and anthropogenic disturbances on the provision of two main ecosystems services (e.g. food provision and recreational services) provided by the lagoon.The development of such models is trans-disciplinary by essence and will have strong implications to guide the adaptability and/or transformability of uses of Moorea lagoon to sustainably derive goods and services in face of regional and global changes. Our model of pre-contact human populations in the ‘Opunohu Valley, Mo‘orea, Society Islands utilizes archaeological and ethnohistorical data in addition to evidence from ethnobotanical studies and soils analysis to provide a multi-scalar perspective. We provide three models of Ma‘ohi population densities utilizing settlement data and land use patterns. The first two models derive population estimates using house count and dwelling-area approaches. These models are compared to a carrying capacity approach which estimates arable land and agricultural productivity. Our models support that there was a significant demographic collapse in the Society Islands following European contact. Archaeologically-based models of pre-contact demographic patterns lead to a better understanding of the complex relationship between population, social and economic processes, agricultural intensification, and environmental change. We have produced Digital Surface Models (DSMs) from the Pleiades image triplets with 70 cm resolution. 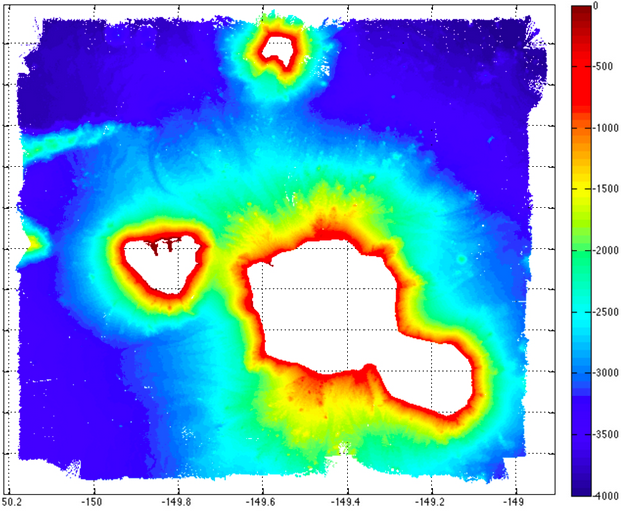 The image orientation has been performed with ~20 GCPs for Moorea and ~8 points for Tetiaroa (the number varies slightly in each image due to point identification issues). The Rational Polynomial Coefficients received from the satellite operator are improved in a bundle adjustment using the GCPs. Subpixel accuracy was obtained in orientation/geo-referencing. A point cloud was generated using automatic matching (using the LPS sytem) over each island and edited manually for blunder removal with stereo viewing to produce high resolution DSMs. The original irregular pointcloud was transformed into a 60 cm DSM raster model. Pansharpening was applied to the multispectral (MS) and panchromatic (PAN) images to obtain high resolution MS images. 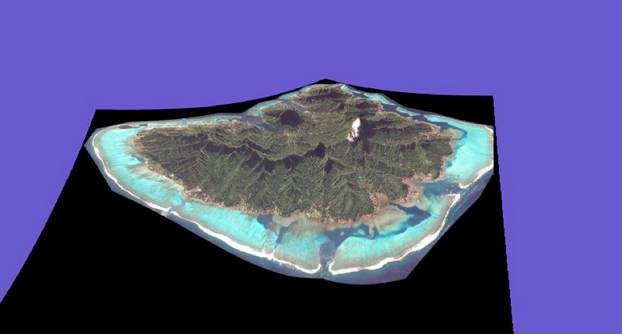 The landscape model of Moorea will be integrated with bathymetry data. The following figures show some views onto the model of Moorea. Physical oceanography involves the study of both physical properties of the Pacfic ocean and the associated circulation. Ocean circulation is intrinsically linked to atmospheric circulation and hence has a tremendous impact on both the climate in the region and the local weather in Moorea. To understand the impact of the ocean on Moorea, we need models which address phenomena at the scale of the ocean (global circulation models) and local circulation models at the scale of the island. Especially the physical mechanisms driving circulation of coral reef–lagoons systems and lagoon–ocean exchange can influence the transport, dispersal, and retention of larval fish, corals, and other invertebrates. The time-dependence of the circulation can also be important. For example, circulation and exchange forced predominantly by tidal fluctuations vary at predictable periodicities, while those controlled by wind- and wave-driven flows can be episodic and subject to seasonal variation in both local and remote forcing. Thus, physical and biological processes dependent on lagoon to open-ocean exchanges may be relatively predictable in some settings and at some timescales, yet far more episodic and/or stochastic in others. The group of Jim Hench has been developing high resolution 3D circulation/wave/transport models for Moorea, including the comparison to intensive field measurements, but more work is needed. The main objective of the Observatory of the Environment is to acquire long-term data series on physical and biological systems. CRIOBE's Observatory of the Environment aims at a better understanding ecological and environmental regulation processes in time and space. Only long-term data series collected through a network of variables allow describing the evolution of a system characterized by intense spatial, seasonal and interannual variability. The Polynesia Mana Observation System (SO INSU) together with CNRS Institute for the Sciences of the Universe. Monitoring network of of fish and corals in French Polynesia, Cook, Kiribati, Tokelau, Tonga, Pitcairn, Niue, Wallis et Futuna. Since 1992. Moorea MPAs monitoring system. Monitoring network of corals, algae, fish, mollusks and echinoderms, inside and outside MPAs around Moorea. Yearly since 2004. 24 hours of Tiahura, Moorea: water sampling every hour during 24 hours to study microbial diversity. The Moorea Coral Reef (MCR) LTER (mcr.lternet.edu) was established in 2004 to investigate community and ecosystem effects of pulsed perturbations and slowly changing environmental drivers on coral reefs, ecologically and economically important ecosystems that are at high risk from local and global stressors. The site is the coral reef complex surrounding Moorea, which includes the lagoon system (with fringing and back reef habitats) and the steeply sloping fore reef offshore. The core issue that unifies MCR research centers on ecological resilience, specifically the processes and attributes that affect the capacity of a coral reef to absorb perturbations and reassemble to a community dominated by stony corals without degrading to an alternative state (e.g., one dominated by macroalgae). The MCR research program addresses two time horizons and the research activities of the project fall into two corresponding themes. Research Theme 1 (Resilience of Contemporary Reefs) focuses on factors that promote or inhibit the return of a perturbed reef community to a coral-dominated state under current levels of stressors from Global Climate Change (GCC) and Ocean Acidification (OA). Research Theme 2 (Structure and Function of Reefs in the Future) addresses the longer time horizon and seeks insight into how forecasted changes in GCC- and OA-related drivers may alter the structure of the benthic community, together with the consequences of those changes to ecosystem processes. Our integrated research program for these inter-related themes includes question-driven time series measurements, long-term field experiments, shorter-term field and laboratory experiments and measurements, and modeling and synthesis activities to integrate and generalize the results. MCR LTER data are available on the MCR LTER website (http://mcr.lternet.edu/data/topic/). All data sets also include metadata and contact information for the MCR LTER's Information Manager and the data set owner. The MCR LTER Time Series Program provides information on physical, chemical and biological attributes of the reefs at 6 locations around the island (two on the north shore, and two on the east and the west shores). Abundances of corals, other macro-invertebrates, algae and fishes are estimated yearly on the fore reef, back reef, and fringing reef at each of the six sites. Estimates are made visually along permanent band transects or from permanent quadrats that, depending on the taxon, are surveyed either in situ (e.g., sea urchins) or later from photo-quadrats (e.g., corals). Organisms (about 400 taxa) are identified to the lowest taxon possible (typically species or genus). In addition, we measure coral recruitment using settlement tiles deployed for 6-month periods as well as yearly visual counts of juvenile colonies on the reef substrata. Inter-annual variation in recruitment of reef fish is estimated from annual counts of fish < 1 year old at all permanent sampling locations. Rates of metabolism (primary production and respiration) are estimated 1-2 times annually along with photosynthetically active radiation (PAR) at two permanent locations on the north shore using a control volume approach. Rates of primary production of three important reef components (coral, algal turfs, macroalgae) are estimated in flume studies. In addition to the benthos, we estimate water column primary production in vertical profiles using standard 14C tracer/bottle techniques at several offshore, inshore and back reef sites. Concentrations of nutrients (NO2-, NO3-, PO43-, SiO42-) are estimated concurrently with water column primary productivity (along with bacterioplankton biomass, DOC and POC concentrations, phaeopigments, Chl a, and turbidity). We also estimate nutrients (NO2-, NO3-, PO4-, SiO42-) at these locations. We use estimates of CHN levels in two macroalgae (Sargassum, Turbinaria) in all three habitats as an integrated estimate of nutrient flux over longer periods. We have instrumented the reefs with multiple sensors to measure factors known to influence coral reefs [water temperature, salinity, current speed and direction, offshore wave climate (height, direction, period), and water levels]. Simultaneous measurements of wave heights and currents are critical given that water flow in lagoons and local circulation patterns are driven primarily by the offshore wave climate. We established two instrumented sites on each of Moorea's shores where biotic surveys are conducted. Time series information on regional scale properties such as currents, water mass variability and meso-scale eddies comes from satellite remote sensing of sea surface topography (TOPEX Poseidon, ERS), temperature (AVHRR), and ocean color (SeaWiFS, MODIS) satellite imagery. In addition to sea level and sea water temperature, we measure pH/DIC, which is related to OA. The extremely slowly changing pH/DIC of the ocean due to increases in atmospheric CO2 is measured at a station 5 km off the island, which minimizes the island effects on the estimate. The MCR LTER project has 18 investigators representing a range of scientific disciplines, including the Principal Investigator Russell Schmitt, 3 Co-Principal Investigators (Peter Edmunds, Sally Holbrook, Robert Carpenter), and 14 Associate Investigators from 6 academic institutions (University of California Santa Barbara, California State University Northridge, University of California San Diego, University of Hawaii, University of California Santa Cruz, and Duke University. Areas of expertise of all investigators can be found on the MCR LTER website. The MCR LTER Deputy Director Andy Brooks (AJBrooks@ucsb.edu) and the Information Manager Gastil Buhl (gastil.gastil-buhl@ucsb.edu) can provide information regarding the project's data resources. We have used high resolutions satellite images with 70 cm resolution acquired by Pleiades satellite over Moorea and Tetiaroa in summer 2014. The images are tasked upon our request and acquired in triplet mode, which provides three images from different angles for stereo processing with a time difference in the order of seconds. The images are displaying some strange and hitherto unknown image artifacts, whose source could so far not finally be determined. However, these artifacts are very small in size and do not threaten the image processing and analysis. Datasets and models on small-scale flows, and strategies for how to separate the dynamics of resolved versus parameterized processes will be developed by a new NSF grant from the Physical Oceanography Division "Relating Topographic Complexity and Circulation Patterns on Coral Reefs from Colony-Scale to Reef-Scale". Social data is collected within projects such as INTHENSE, or obtained from the Institut des Statistiques de Polynesie Francaise ISPF. This data includes the number of Polynesian and international tourists, inhabitants of Moorea and unemployment rate, users of the lagoon, frequence and economic revenue of day tour activities, and other tourist operators. Archaeological data for Mo'orea illustrate a 1,000 year span of settlement and change, both along the coasts and the interior valleys. Most recently, field explorations were carried out at four zones along the coastal plain of Mo‘orea, to reconstruct the island’s geomorphic and cultural history based on stratigraphic records, sedimentology, pollen analysis, and radiocarbon determinations in addition to analysis of floral, landsnail, and insect remains. 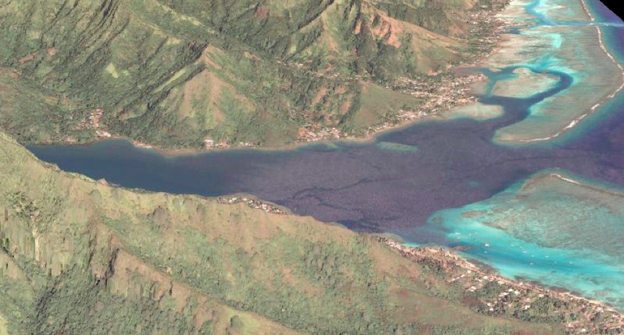 A range of significant environmental processes, including sea level change, island subsidence, and anthropogenic alterations leading to changes in sedimentary budget have operated on Mo‘orea coastlines from ca. 4,600 to 200 BP. We document significant transformation of littoral and lowland zones which obscured earlier human activities and created significant changes in vegetation and other biota. Beginning as early as 440 BP (cal AD 1416-1490), a major new phase of sedimentary deposition commenced which can only be attributed to anthropogenic effects. At several sites between 1.8 and 3.0 m of terrigenous sediments accumulated within a span of two to three centuries due to active slope erosion and deposition on the coastal flats. This phase correlates with the period of major inland expansion of Polynesian occupation and intensive agriculture on the island, indicated by the presence of charcoal throughout the sediments, including wood charcoal from several economically important tree species. Socio-political changes in the interior valleys resulted in shifts to settlement patterns, most notably 1) elaboration of elite status house sites; 2) elaboration of monumental temples, built by the elites to gather surplus from surrounding communities, and 3) the construction and enlargement of agricultural complexes for taro cultivation and aboriculture. We have illustrated these changes through survey, excavation, mapping, and dating of site complexes, including U-Th dating of several interior valley temples with coral elements in their architecture. 3. W.D. Sharp,, J.G. Kahn, C.M. Polito, P.V. Kirch, Rapid evolution of ritual architecture in central Polynesia indicated by precise 230Th/U coral dating, PNAS, vol 107, pp. 13234-13239 (2010). The Moorea Biocode Project was established to create the first comprehensive inventory of all non-microbial life in a complex tropical ecosystem. Supported by a grant from the Gordon and Betty Moore Foundation, an international team sampled the island's animal and plant life intensively between 2008-2012. 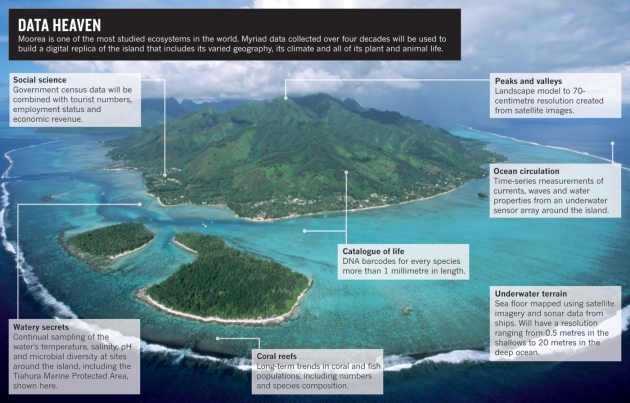 Working through the Moorea Ecostation, the project aimed to characterize every species (>1mm) on the island from its coral reefs to mountain forests, including genetic sequences, museum specimens, and digital photographs of representative individuals. The data and specimens are available through public repositories and natural history collections as well as through the project website. In future phases, the Biocode reference library of genetic markers and physical identifiers is being used to support ecological and evolutionary studies under the Moorea Genomic Observatory. MIRADA LTERs is carrying out a Microbial Biodiversity Survey and Inventory across all the major aquatic (marine and freshwater) Long Term Ecological Research (LTER) sites established by the NSF's US LTER Program. Our inventory takes advantage of the aquatic sampling locations that are part of the established LTER network of sites and builds on existing infrastructure for coordination at the Marine Biological Laboratory (MBL) in Woods Hole, Massachusetts set in place by the Alfred P. Sloan Foundation supported Census of Marine Life (CoML) ocean realm project called the International Census of Marine Microbes (ICoMM).